In a magnificent 5th stage at the Dakar, Monster Energy Honda’s Joan Barreda Bort proved too hot to handle, commanding throughout the penultimate date in Peru. In addition to clawing back fourteen minutes from the race’s overall leader, the Spanish rider scales the leader board to fourth place. Benavides, third on the day, lies in second position in the general rankings. Joan Barreda played his strategic hand yesterday and it paid off handsomely. The Spanish ace from Honda pulled out all the stops and romped home with a lengthy advantage that places him right back in the running for the overall prize. The rider from Castellón, Spain, started from 9th position, set an infernal pace from the first control point and reached the finish line after overcoming the impressive Tanaka dunes trouble-free. 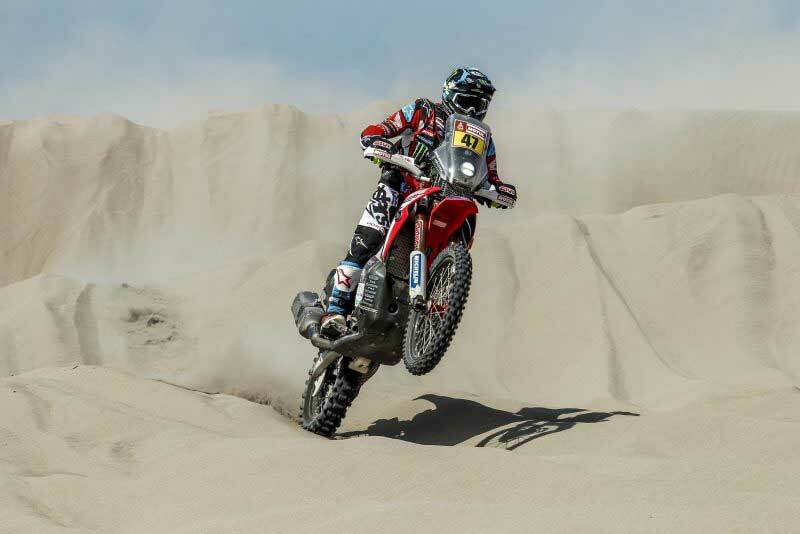 Barreda finished the stage with a 14:30 minutes advantage over race leader Adrien Van Beveren. This marks the Spaniard’s second stage victory in this Dakar, the 21st of his career and has helped him leap to fourth overall, a mere 7:30 mins adrift of the French leader. "I knew that we would have to battle to make up the time as it was the final stage in the sand dunes," siad the Spaniard. "I went all out, at very high speeds and it went well. I was able to pull back some minutes and we are back in the top ten that keeps us practically with the same options as the first day. This is really important and I hope that we get the chance to make up even more time." After celebrating his 29th birthday Tuesday, Kevin Benavides continued in the same vein to post third spot on the day and move up a place to second overall position, 1:30 minutes off the leader. "The idea was to go out and attack and it went pretty well but I had a slight mishap with the fuel and I lost some time fixing it," said Benavides. "I went ahead, pushing hard, until I had a scare and then I took it more calmly. I finished 3rd and I think it was a good stage, as hard as it was. The dunes were very soft and there was a lot of fesh-fesh and the second special was ruined by the cars and trucks that went before us." US-American Ricky Brabec, likewise, performed well in the special, finishing 9th. "The day was tough," said Brabec. 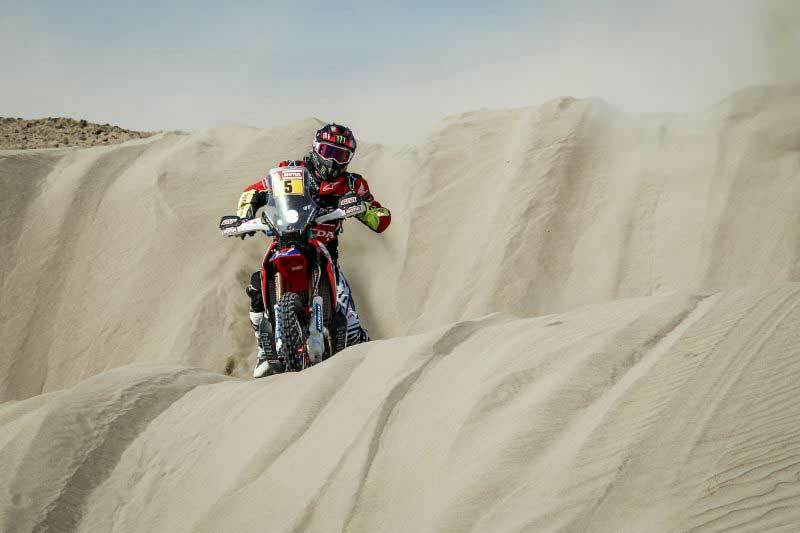 "There was a lot of sand dunes again and the first special was really good for me with a lot of tracks to follow. The second special was horrible because all the cars started ahead of us and that made it difficult for me to go to the dunes. I didn’t choose the correct tyre. But we’re here and we are ready to go again for Thursday." Michael Metge, after an erratic start to the stage, managed to overcome his problems and eventually take 12th. "I left motivated to ride a good stage, but at kilometer 30 I lost some time looking for the waypoint," reported Metge. "Then I caught the rider who was ahead of me, and recovered some of the lost time. But in a dune I have twisted my left ankle in some ruts and I had to slow down the pace because it hurt a lot. I could not stand on the bike and it has punished my back. I hope Jordi, our osteopath can solve in order to be better." "Wednesday there have been some casualties at this stage, which means that it has been very difficult," stated Raul Castells, Monster Energy Honda Team Manager. "We are happy with the job that the team has done, especially Joan Barreda, who has recovered a lot of time and has jumped many positions in the general rankings. Kevin also excelled and is second in the overall standings again. The rest also had a good day. We are well placed in the race, but there are still many days ahead and many kilometers. Thursday we will arrive in La Paz and the rest day, which we also need. There we will make a deeper assessment of how this first part of the race has gone."